It's already been a year! 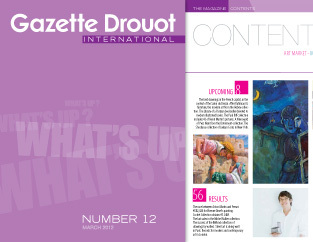 Time goes by so fast, and it's now twelve monthssince La Gazette Drouot launched its international edition by publishingit on the Internet. A daring bid? Without a crystal ball, the press in generalis in the dark when it comes to picking the right formula. With our onlineversion, we opted for digital information and innovation in bringing youthe best of the art market directly to your tablets. One year: grouchesmight say that's not very long, while the more positive-minded might sayit's pretty good at a time when press titles are becoming increasinglyscarce! Especially as exciting things are going on in the art market, withan almost constant stream of huge bids and a wealth of treasurescoming to light: the jewels in Elizabeth Taylor's collection, the nuggets inthe Weiller collection, the gems from China (like this 18thcentury scrollshowing Emperor Qianlong's large-scale manoeuvre, sold in Toulouse for€22M), not to mention the ivories in the Marquet de Vasselot collectionand the Marchals' merry-go-rounds. The past year has been full of exhila-rating moments, and the momentum seems unstoppable. Contempo-rary arts sale results in London have confirmed the high potential of inter-national buyers, while in Paris, where the season has only just begun, theupcoming sale of the Pierre and Geneviève Hebey collections augursextremely well. So let's take stock again in a year's time!